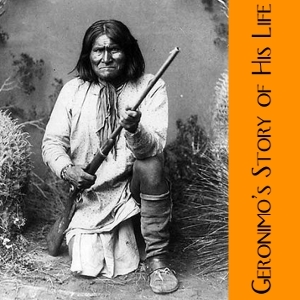 Geronimo’s Story of His Life is the oral life history of a legendary Apache warrior. Composed in 1905, while Geronimo was being held as a U.S. prisoner of war at Fort Sill, Oklahoma, Geronimo’s story found audience and publication through the efforts of S. M. Barrett--Lawton, Oklahoma, Superintendent of Education, who wrote in his preface that “the initial idea of the compilation of this work was . . . to extend to Geronimo as a prisoner of war the courtesy due any captive, i.e. the right to state the causes which impelled him in his opposition to our civilization and laws.” Barrett, with the assistance of Asa Deklugie, son of Nedni chief Whoa as Apache translator, wrote down the story as Geronimo told it --beginning with an Apache creation myth. Geronimo recounted bloody battles with Mexican troopers, against whom he had vowed vengeance in 1858 after they murdered his mother, his wife, and his three small children. He told of treaties made between Apaches and the U.S. Army--and treaties broken. There were periods of confinement on the reservations, and escapes. And there were his final days on the run, when the U.S. Army put 5000 men in the field against his small band of 39 Apache. Geronimo had been a prisoner of war for 19 years when he told his story. Born in 1829, he was by then an old man, no longer a warrior, and he had come to an accommodation with many things “white,” including an appreciation of money. U.S. Bureau of Indian Affairs personnel took him to the St. Louis World’s Fair in 1904, where he roped cows in the “wild west show” and signed his name for “ten, fifteen, or twenty five cents.” By then he was perhaps the United States’ most “famous” Indian. In 1905 he was even invited to ride horseback in President Theodore Roosevelt’s inaugural parade (though still a prisoner of war! ).